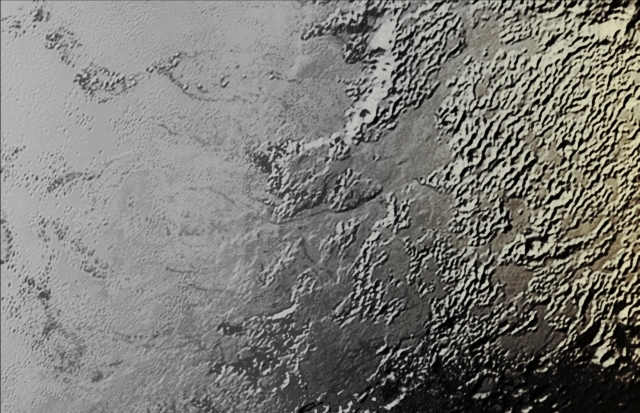 The Ice (which is - probably - made of frozen Nitrogen) that appears to have accumulated on the Plutonian Uplands situated on the right side (Dx) of this approx. 390-miles (such as about 627,6426-Km) wide image, is draining from Pluto's Mountains onto the (so far) informally named Sputnik Planum, through the roughly 2- to 5-miles (such as about 3,21 - to 8,0467-Km) wide Valleys located near the center of the frame. The Flow Front of the Ice that is (slowly) moving into Sputnik Planum is clearly visible towards the center left side (Sx) of the picture. The origin of the Ridges and Pits located on the right side (Dx) of the image is still uncertain. The picture (which is an Original NASA - New Horizons Spacecraft's b/w and NON Map-Projected frame published on the NASA - Planetary Photojournal with the ID n. 19944) has been additionally processed, magnified to aid the visibility of the details, contrast enhanced and sharpened, Gamma corrected and then colorized (according to an educated guess carried out by Dr Paolo C. Fienga-LXTT-IPF) in Absolute Natural Colors (such as the colors that a normal human eye would actually perceive if someone were onboard the NASA - New Horizons Spacecraft and then looked outside, towards the Dwarf-Planet Pluto), by using an original technique created - and, in time, dramatically improved - by the Lunar Explorer Italia Team.